Belkin Wemo Smart Light Switch Giveaway $50 Value! Wouldn’t you love to control the lights in your house with the touch of your smartphone or tablet? Verizon is hosting an amazing #IoTForHome Twitter Party on 09/1/14 to show how you can connect your home. To get the party started early, Verizon wants to give everyone the chance to win a pre-party prize! Be sure to see all that Verizon has to offer. Also, be sure to RSVP and join us for a fun and informative Twitter Party with Verizon Wireless on 09/01/14 at 7:30 pm (ET). 1 RSVP’er will win a Belkin Wemo Smart Light Switch exclusively from Verizon Wireless ($50.00 Value)! The giveaway ends on 09/01/14 at 7:30 pm (ET), when the Twitter Party begins. Join me & RSVP for the Verizon Wireless #IoTForHome Twitter Party September 1st @ 7:30 pm ET! 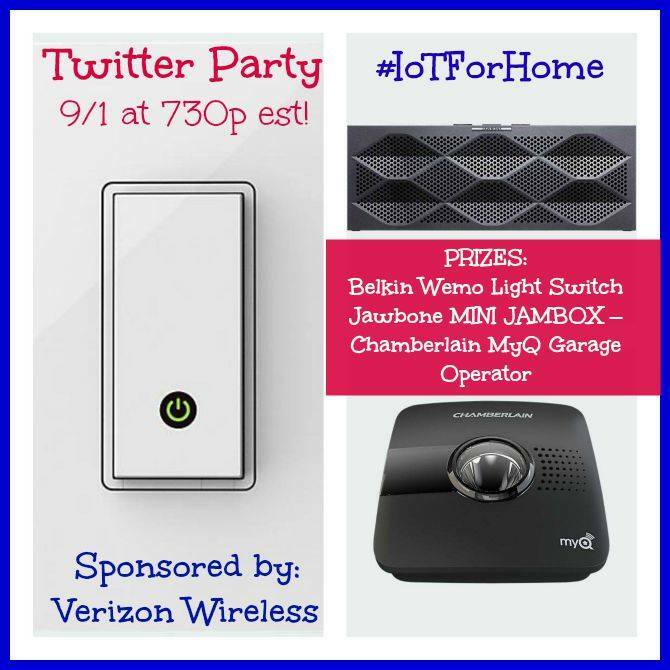 September 1st at 7:30 pm (ET) we are having the #IoTForHome Twitter Party!!! Be sure to join us on Monday,December 1st at 8pm (ET) and follow along using the party hashtag (#ConnectedHoliday). You can use pages like Tweet Deck or Hootsuite to follow along (both free). Follow along on Tuesday, September 1st (7:30 pm ET) and chat with us, learn more how get your home connected and control at the tip of your fingers. Remember to use #IoTForHome in each Tweet you post. Prize Eligibility: You MUST RSVP to be eligible to win prizes during out twitter party! Prior to the party, you must RSVP and follow along using #IoTForHome during the party. Prizes are available to US Residents, ages 18+years of age and limited to one prize per household. I’d like to connect my front porch light. I would love to have the TV and the cable box connected. Definitely the lights. We often have it turned off and need it on to see something. I’d either like to be able to control lights or be able to open and close my garage door. I agree with everyone else, definitely the lights. Thank you! This has been on my wishlist for so long! I would love to be able to control our lights with this. I would connect my kitchen lights, this would also light the back deck to avoid falls in the dark when returning home after dark. We’d probably use it for the porch lights, for when people come home at night. My household lights…what a bright idea! I would like to have my TV connected to my smartphone. The television would be awesome! I would love to connect the lights in my house. Particularly the kitchen one so I can make it seem like we’re home when we’re out of town and the front porch light so I can see the darn lock! I would love to be able to control my sons light from my phone! The little stinker always leaves it on! I would be worried about hackers messing with my lights. I would love it for our porch light. I would love to be able to control the lights. I would love to connect home security to smartphone. I’d like to connect the front porch light. It would be cool to have the T.V. connected to my smartphone! My family is notorious for leaving light on. Definitely control the lights. The things I would love to have connected in my home are the ceiling fans and heating/air conditioning! I would like to be able to control my lights from my phone, especially when I’m away. My garage. If it would work while I was in town and Gracie needed in. That actually happened once Gracie was locked out. I was a mess! I would love to have my air conditioner connected and controlled by my smartphone. I get chilled very quickly and get tired of dropping whatever I’m doing to run down the hall and turn it up again. I’d like to have the lights connected. I would love to have my lights connected to this. It would make things so much easier. This is just what we need. I would like to connect the small air conditioner to the phone. I would connect my house lights so I can turn on the lights for instance when we are out later than planned and forget to have them on. I’d love to have the downstairs lights connected to my phone so I wouldn’t have to go back downstairs to turn the off at night! I would like to have various house lights controled by my phone. I would love to have my lights connected to my phone. I would love to have the lights connected. Id like my garage door opener! I would say the lights. I would love to control my heat via smart phone. I would love to have the lights in my upstairs connected to my phone! the light switches seem to be in all the wrong places! I would love to connect my tv to my smartphone! Would be cool to connect my washer and dryer. I hate always walking down to the laundry room just to turn it on again.